It has officially begun with the arrival of the Olympic Flame to the UK last week carried by a very well dressed David Beckham. And talking about well dressed people, there has been a lot of talk and unveiling of Olympic uniforms lately, and some of them carry some big names with them. Stella McCartney designed the uniforms or kit for the British team but somehow her designed has been quite controversial. Despite the fact that she did used the flag as her inspiration critics has questioned her creative use of it as they have little red in them. The three colors on the flag represent the union of England, Scotland and Ireland. Giorgio Armani, a sports fan, designed the uniforms for the Italian team. One of the notable details of the uniforms is that they have the lyrics of the national anthem printed or phrases stitched on them. Team USA will be sporting Ralph Lauren's designs during the closing and opening ceremonies as well as some other accessories through out the whole Olympic games. Don't they all look like models? These guys in the image are all athletes! I love how colorful are the uniforms for the German Olympic team. Athletes from the team presented the uniforms in Dusseldorf and even though there is no mention of who was responsible for the design I think they are a lot of fun. The athletes uniforms for the Australian team will help them perform better because they are made with high tech materials. For the opening ceremony, they'll be wearing a uniform that makes them look quite elegant and cosmopolitan. Have a great Monday and start of the week! Oh my! I am so excited!The UK team looks gorg! Thanks for featuring this, I have no idea whats going on in the Olympic world. The uniforms are so chic and stylish...how things have evolved since say 20 years ago! i like the uniforms! excited for the start of the olympics!! How very cool - thanks for sharing. Go Team USA! Love team USA's outfits! That dress is adorable! Sigh, I'm supposed to be over there in the UK this summer. Looks like it's not going to happen. So sad! You've managed to get me quite excited for the Olympics! My husband loves watching them and I enjoy it also but haven't been as excited this year. He's been trying to get me on board - guess it took a little fashion to do the trick. My mother is from England so I've been looking at the Union Jack all my life. My first thought was "not enough red". Nice to change things up but I'm not in love with them. Like Armani's designs (of course) and ours are great too! Ooh I love all the celebrity designers and designs! Can you imagine heading to the Olympics and picking up your Armani or Ralph Lauren ensemble? I just love it! How great that athletes get to be so fashionable! This is such a great post. I love it!!! The selection of pics is just amazing!!!! Very intersting post, i didn't know all these thinghs about olympics uniforms! I actually love the USA ones. Totally classy. I love all of these uniforms!!! Olympic Fashion at its best. i'm really excited for the olympics! team usa is always dressed so nicely, but i'm a bit jealous that great britain gets stella mc cartney. Love it! This reminds me of one of the challenges on Project Runway when the designers had to make athletic wear! I love how you can make it still look chic! omg, could the Italians be any chicer? I would have to defect to their country if it came down to wearing one of these outfits! Hope you had a great weekend Elie! Incredible!! The Italians and the Americans are pulling off some serious style. It's so funny how fashionable the Olympics have become! It's a way to display lots of Cultural treasures. Cool post! what amazing outfits, love!! and those sketches are really nice as well!! I love the lyrics that have been including in the Italian outfits- pretty cool. I live in the UK and I am trying to get excited about the Olympics, maybe when it's a bit closer!! Love that designers get involved with the Olympic uniforms!! Can't wait for the games!! 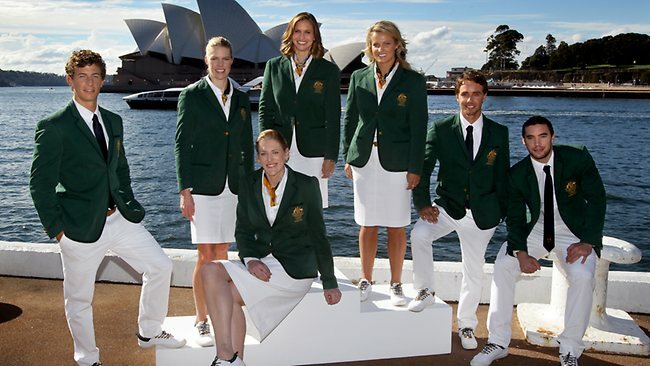 I feel like the Aussie team were on a yacht in 1983 and were swallowed by the sea in the Bermuda triangle. 30 years later they resurfaced in Sydney Harbour. I do like them, but this bizarre thought popped into my head! I love watching the uniform releases come out - can't wait to see them in person this summer.